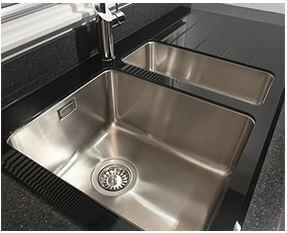 The KVL01BL is a black tempered glass, single bowl sink. It is scratch, stain and heat resistant to withstand tough use in the kitchen and its finish and design are both elegant and sleek, complementing your modern kitchen perfectly. The KVL01LBL is a black tempered glass, single bowl sink. It is scratch, stain and heat resistant to withstand tough use in the kitchen and its finish and design are both elegant and sleek, complementing your modern kitchen perfectly. The KVL02BL is a black, tempered glass one and a half bowl sink. It is scratch, stain and heat resistant to withstand tough use in the kitchen and its finish and design are both elegant and sleek, complementing your modern kitchen perfectly. The KVL02LBL is a black, tempered glass one and a half bowl sink. It is scratch, stain and heat resistant to withstand tough use in the kitchen and its finish and design are both elegant and sleek, complementing your modern kitchen perfectly. At first glance, glass might seem an impractical choice due to its fragile reputation. However glass has many properties that make it the perfect sink material. Glass is naturally heat resistant and you can safely put hot things onto the surface without fear. It is also scratch and stain resistant, coming back up to a brilliant shine every time you clean it. All our glass is tempered and toughened to help prevent shatters, breaks and any other damage that could affect the sink. 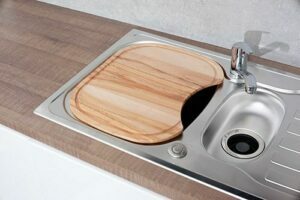 We have created designs in a single bowl style and a bowl and a half size so that you can decide whether you would prefer to have that extra room for draining and pouring liquids away, even if the main sink is full. Due to the nature of glass, we wouldn’t recommend that you drill your own tap holes at home. This is why we have a right-handed and a left-handed version of each design so that you can order exactly the style and layout you are after to suit the way you work. We’ve also included noise deadening pads in the installation kits for these sinks. This means that the bangs, clatters and general noise of putting things into the sink is lessened and absorbed by these pads. Probably the most elegant of our sink designs, the smooth black surface is accompanied by brushed stainless steel inside each of the bowls. The combination of the two creates the perfect modern aesthetic for glamorous kitchens. The glass sinks looks stunning when combined with a tap from our designer range, and the reflective surface of the tap will mirror the style and shape of a sculptured tap beautifully. We think that these sinks look best when combined with a natural stone or composite work surface to really bring out the best in its smooth design, glossy finish and low profile styling. There is also a complete range of accessories to accompany our sink ranges and make life much easier in the kitchen. Washing up baskets that prevent scratches in the sink bowl from knives, colanders that fit snuggly into the central half bowl sink to make draining a cinch and chopping boards that sit on top of the sink bowl all work to make the kitchen work harder so you don’t have to. We have also created a complete range of buying advice guides to help you make the final decisions about your kitchen sink as well as caring for the style and material of sink you have chosen in the long run. Click here to select from the different sink guides in this category. CDA sinks also come with a 5 year guarantee for peace of mind. Always make sure that you register your appliance or sink as soon as it is installed to make sure that you are covered if anything goes wrong.